Teddy Segore, one of the pilots with Charis test-flies one of the drones to be deployed in the spraying of larvicide that will target mosquito-prone areas across the country to curtail malaria spread. After a few minutes spent entering flight and insecticide treatment plans, a click of the start button on the tablet sets things in motion. There's a brisk rise in the clearly audible buzz as the unmanned aerial vehicle takes off. Its mission is to spray and spread larvicide across the fields believed to be habitat for malaria-carrying mosquitoes. Such was just an imaginary scenario back in the day as unmanned aerial vehicles (UAVs), popularly known as drones, were only seen hovering over to take pictures and to do a few other mapping activities. Worse still, the drones made a name for themselves globally for their use in warfare, either dropping bombs, or doing reconnaissance activities on enemy territory. 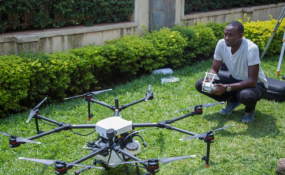 Following the Government of Rwanda's partnership with Charis Unmanned Aerial Solutions, a local drone technology company, sprayer drones could be used in the country to rid communities of malaria-carrying mosquitoes. This kind of drone is fitted with a 10-litre tank that can carry insecticide, follow pre-mapped routes and spray and spread it over fields that host mosquito larvae, which mostly live in stagnant water. "While this has been used elsewhere, we believe this is an innovation in Rwanda because we are going to do things differently," Eric Rutayisire Muziga, the company's Chief Executive Officer told The New Times. Such drones make sense where they replace labour-intensive and use of back-pack sprayers, which are deemed to be inefficient. Muziga says the drones have the capacity to fly for about 15 minutes on a single battery and ability to spray an area of 40 hectares in a day. Dr Aimable Mbituyumuremyi, the Division Manager for malaria and other parasitic diseases at Rwanda Biomedical Centre (RBC), said they are finalising the partnership with the company with hope that the drone technology will bring more benefits in the fight against malaria. "We are negotiating to see how this technology can help us in malaria control because the same technology has been used in other countries to control mosquitoes," he said. The drone technology, he added, would help them to reach certain areas where conventional pump sprayers could not reach, including in marshlands, rice paddies and other fields. Currently, the Ministry of Health conducts only indoor residual spraying across the country once in a year. However, malaria prevalence has been on the rise for the past five years. Information from the Ministry of Health indicates that, since the end of 2012, Rwanda has experienced an increase in malaria morbidity, and generally, approximately 90 per cent of Rwandans are at risk of malaria. Simple malaria cases increased from about a million in 2012 to 4.5 million in 2016 rise while severe malaria cases increased from 9,000 to 17,000 during the same period. Preliminary data from RBC shows that total malaria cases dropped to below 4 million by end 2018. Furthermore, a decrease in severe malaria cases from 17,000 in 2016 to less than 7,000 in 2018 was noted while mortality due to malaria reduced from 700 in 2016 to around 300. This is not the final consolidated data as December is not included, according to the Centre. The Ministry attributes the positive trend to the many community-based interventions that have been put in place, including indoor residual spraying in high endemic districts, distribution of bed nets countrywide and to targeted groups like pregnant women and young children under one year. Government also introduced home-based management of malaria by community health workers as well as free medical treatment to economically disadvantaged groups. Mbituyumuremyi said using drone technology to spray habitats of mosquito larvae could kill them before they grow to enter into households. The exercise would take place across the country, but with options of prioritising high endemic zones for malaria, especially in Eastern and Southern provinces. "We want to start this technology with a few districts but the overall goal is to have all targeted districts sprayed using drones as a new technology," he said, highlighting that they are still in negotiations to figure out what would be the cost of adopting this technology in the long term. Once the negotiations are concluded, the exercise would take place at least twice a month, and there is optimism that this will help the country to significantly check malaria.